Street side of Ruby Bridges mural at Jazale’s Art Studio. Photo by Zach Komassa. 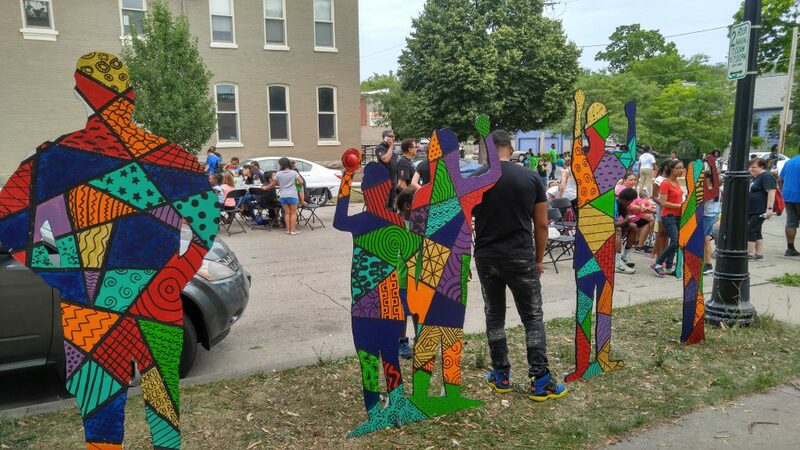 Members of the Boys and Girls Clubs of Greater Milwaukee involved in the Mural Arts Program unveiled their Building Bridges art instillation at a block party on Thursday afternoon. The event included the unveiling of a new mural in remembrance of civil rights pioneer Ruby Bridges, as well as games and festivities for community members. The event featured remarks from Sheri Williams Pannell, Producing Artistic Director of Bronzeville Arts Ensemble and Assistant Professor of UW-Milwaukee Peck School of the Arts; Vedale Hill, Mural Arts Program Instructor; and Darren Hill, co-owner of Jazale’s Art Studio. The block party took place on W. Brown St. between MLK Dr. and 2nd St., a block which includes Jazale’s studio at 1950 N. Dr. Martin Luther King Jr. Drive. The event revolved around honoring historic trailblazer Ruby Bridges by showcasing the youth-created mural. Bridges (born September 8, 1954) was just six years old when she became the first African-American child to integrate a white Southern elementary school on November 14, 1960. The mural includes life-sized silhouettes of Bridges and other important figures involved during her first day of school. The Building Bridges project began nearly six months ago, leading youth club members to visit artistic landmarks in New York, Chicago, and of course, Milwaukee. The young artists chose to focus on Bridge’s experience during the Civil Rigths Movement since it was important to them and reflects Milwaukee’s diverse culture. Vedale co-founded Jazale’s Art Studio with his brother Darren, and each are involved in the Mural Arts Program, which gives Boys and Girls Club members the opportunity to work on this installation of art for the community. “I want to give it up to the kids who made this possible, and who make my life better every day,” stated Vedale in his remarks. 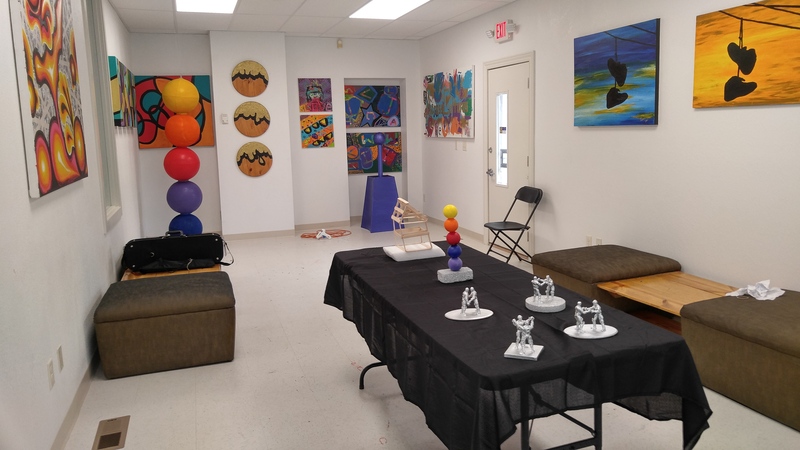 Jazale’s Art Studio also had its doors open at the block party, allowing visitors to see a display of other paintings and sculptures made by various club members. The Hill brothers take pride in not only showing youth how to express themselves artistically, but how to become involved in efforts to build a better community. Paintings and sculptures featured inside Jazale’s Art Studio. Photo by Zach Komassa. “… I just want to help them to be better people in general,” Vedale said. Pannell engaged youth at the event by recounting the history of the efforts to desegregate schools, and the struggle African-American students went through historically to get a decent education. She then detailed key moments of Ruby Bridges’ life as a child, and how the Building Bridges project was inspired. “… I hope you, like Ruby, will choose to walk in such a way that you make a positive difference in our community, and as you walk, bring another soul with you — be that bridge,” exclaimed Pannell. Jazale’s Art Studio was only the first stop of the Building Bridges instillation. The youth project will also make its way to America’s Black Holocaust Museum and other Boys and Girls Club locations.